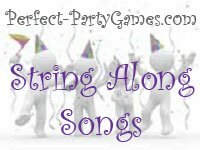 Summary: String Along Songs is a game about associating song titles through use of the same words. 1. A song title can not be repeated. 2. The next player or team must respond when it is their turn within 10 seconds. 3. If a player or team does not respond, they are eliminated from the game. 1. Give each player or team 5 minutes to brainstorm as many song titles as they can and write them down. These must be song titles, not lines within the song. 2. Choose a team to read one title from their list. 3. The next team must then say a song title that has at least one word from the first teams song title. "If You Don't Believe I Love You, Just Ask My Wife"
Winner: The last player or team left in the game wins. Variations: Play this at your next Christmas party and have all the songs be Christmas carols or other Christmas themed songs.